Overview - After years of wooing director John Huston via good reviews, film critic James Agee was given a chance to write the screenplay for a Huston picture. Adapted from a novel by C.S. Forester, The African Queen stars Humphrey Bogart in his Oscar-winning portrayal of Charlie Allnut, the slovenly, gin-swilling captain of a tramp steamer called the African Queen, which ships supplies to small East African villages during World War I. Katharine Hepburn plays Rose Sayer, the maiden-lady sister of a prim British missionary (Robert Morley). 'The African Queen' has been consistently praised and admired by critics and audiences alike since its 1951 premiere, but for several years John Huston's stirring romantic adventure also carried the dubious distinction of being the only picture on the AFI's list of the 100 Greatest American Movies yet to see a digital release. That frustrating fact sent diehard cinephiles into periodic apoplectic fits, but Paramount, after much wrangling, at last secured and then painstakingly restored the film's original three-strip negative, which had been locked away in a British vault. (According to the studio, all American prints had deteriorated to such a degree they were unsuitable for remastering.) And now, after what seems like an eternity, this Holy Grail film hits the home video market not only in standard definition, but also in glorious 1080p. And let me tell you, the wait has been worth it. Classic movie fans who don't rhapsodize over this superior effort, which breathes new life into this venerable drama, should head straight to the optometrist, because 'The African Queen' is a kingly specimen that will thrill even the most discriminating high-def viewers. Notable for its ambitious location shooting in the Belgian Congo, colorful production history, terrific chemistry between stars Humphrey Bogart and Katharine Hepburn, and sweet, captivating story (based on the novel by C.S. Forester of Horatio Hornblower fame), 'The African Queen' scored big upon its initial release and hasn't lost any of its luster since. Bogart won his only Academy Award (beating the likes of Marlon Brando in 'A Streetcar Named Desire' and Montgomery Clift in 'A Place in the Sun') for his role as the gruff, grimy, gin-soaked Charlie Allnut, skipper of The African Queen, a rickety riverboat that delivers supplies to, among other places, a small, isolated mission run by the Reverend Samuel Sayer (Robert Morley) and his prim, virtuous sister, Rose (Hepburn). Unaware of a major conflict known as World War I, Samuel and Rose are shocked to hear from Charlie about an imminent German invasion, and when Kaiser Wilhelm's soldiers overrun the mission almost on cue, the siblings watch in horror as troops ransack and burn their settlement. The trauma and devastation send Samuel to an early grave, leaving Rose to fend for herself in the wilds of The Dark Continent. When Charlie stops by to assess damage and offer help, he never dreams the dogged Rose will shanghai him and his boat, taking them on a dangerous journey down river that will continually test their courage and tenacity, all in the hope of finding and destroying the German gunboat that harbors the regional command. Along the way, the dilapidated African Queen must traverse treacherous rapids, cut through dense brush, and survive rough storms, while its two oil-and-water shipmates spar, bicker, and ultimately become smitten. Charlie and Rose's romance is as unlikely and unexpected as it is endearing and cute, and the middle-aged couple often acts like two starry-eyed teens basking in the unsullied bloom of young love. Their strong emotions, however, never weaken their resolve to confront and cripple the wily Germans, but executing their preposterous plan will take every ounce of energy and blind faith they can muster. The long-standing appeal of 'The African Queen' may be due in part to its against-all-odds attitude and core values of guts and perseverance, but more likely stems from the irresistible appeal of its improbable hero and heroine. The notion that a blasphemous drunk and pious spinster could fall in love, let alone have the audacity to believe they can take down a well-oiled military machine, is both ludicrous and delightful, and Bogart and Hepburn play their roles to the hilt. Never for a moment does their affection seem anything less than genuine, and with a mastery of their craft that few others in the industry possess, the two legendary actors infuse their eccentric, charismatic characters with palpable warmth and spirit. No stranger to big, outdoorsy tales of indomitable will and chutzpah, Huston (who teamed with Bogart on the equally rugged and immortal 'The Treasure of the Sierra Madre' just three years before) deftly blends rousing physical sequences with scenes of exquisite tenderness and charm. The director's keen sense of rhythm keeps the story flowing like the river itself, ramping up tension at some points, gently drifting along in others, to create a comfortable mood punctuated by stunning landscape and wildlife shots. The marvelous script (which he co-wrote with James Agee) contains several memorable exchanges, and despite the fact that most of the film is a two-person dialogue, the characters are so richly drawn and brought so vividly to life by the actors, we never tire of them. Amazingly, 'The African Queen' was not nominated for Best Picture, but both Huston and Hepburn did receive nods for Best Director and Actress, respectively. (Huston was beaten by George Stevens for 'A Place in the Sun,' while Hepburn lost to Vivien Leigh's Blanche DuBois.) Yet the lack of awards recognition can't diminish the film's lasting impact or the reverence it engenders. Charlie and Rose, as sweaty and disheveled as they often appear, and as quirky and stubborn as they often act, are one of the movies' immortal couples, ranking right up there with Scarlett and Rhett, Rick and Ilsa, and Jack and Rose. Their passion may be muted and their age advanced, but they're still quite a pair. 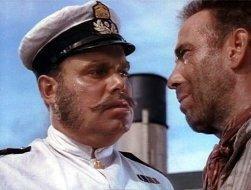 And 'The African Queen' is still quite a film. Movie buffs have waited far too long for a digital transfer of 'The African Queen,' so expectations understandably ran high when Paramount announced its 4k restoration of the 1951 film. Working from the original three-strip negative, technicians scanned and digitized each element, then recombined and carefully aligned them before removing any dirt, nicks, and scratches. The process was long and arduous, but any doubts 'The African Queen' might arrive on Blu-ray looking less than its best vanish immediately upon one's first view of this stunningly beautiful rendering. Breathtaking clarity and sharpness, lush color, and plenty of high-def pop all belie the picture's advanced age and make this antiquated classic almost seem like a new release. 'The African Queen' was shot under rough conditions, so it's a tribute to master cinematographer Jack Cardiff that the image is so well balanced and exudes such a natural feel. Medium grain adds lovely texture and warmth, and though it's at times a bit too visible against solid objects (most notably, the blue sky), it's never intrusive. Three-strip Technicolor can often adopt a garish, artificial tone, but Cardiff keeps the hues in check, so Africa looks like Africa and not a Disney imagineer's vision of it. The colors still exhibit plenty of boldness and vivacity – evident in the blue river and blooming flowers – but they rarely call attention to themselves. Pitch-perfect contrast gives some shots a dimensional look and velvety sheen, while fine shadow delineation spruces up nocturnal sequences. Details, even in the background, remain well defined, and the driving rain possesses such marvelous clarity, it often looks like little needles falling from the heavens. Close-ups, especially those of Bogart, are sublime, highlighting every nook and cranny in his weathered face, and though Hepburn is photographed in soft focus, her classic features (oh, those cheekbones!) still come across well. Omnipresent beads of sweat are also visible, and the thick brush the pair must hack through is marvelously distinct. The African countryside and wildlife, especially a herd of crocodiles, nearly jump off the screen, often producing a you-are-there effect that thrusts us into the action. Some of the rear projection shots still look overly processed – though if you watch the included documentary (see below) you'll see just how much they've been improved – but that's a minor nitpick. Thankfully, no noise reduction has been applied, and banding and edge enhancement are altogether absent. 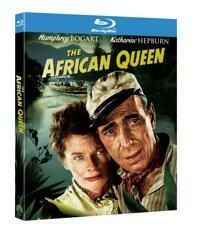 Could 'The African Queen' look any better on home video? Absolutely not, and I'm pretty sure it's never looked this good period. Paramount deserves major props for investing so heavily in this classic title, and I think I can speak for all fans of Hollywood's Golden Age when I say I hope the studio will release more treasures from its vault in the not-too-distant future. Paramount hasn't tried to sup up the audio on 'The African Queen,' and that's just fine by me. The original mono track gets the job done, producing full-bodied sound with plenty of tonal depth and presence. Though a bit of hiss still remains, the clean-up has been thorough, erasing any age-related pops, crackles, and static. Dynamic range is quite good, with high ends resisting distortion and low ends possessing good weight, and the action-oriented scenes fill the room well, even without multi-channel activity. And just because the track is front-based doesn't mean we don't pick up all the ambience of the African setting. On the contrary, the animal noises, buzzing of bugs, and rustling of foliage all come across quite well. It's not exactly immersive audio, but it represents the locale well. Best of all, dialogue is always clear and easy to comprehend, and Allan Gray's music score benefits from solid fidelity. For an almost 60-year-old soundtrack, 'The African Queen' sounds mighty spry. Documentary: "Embracing Chaos: Making 'The African Queen'" (HD, 59 minutes) – A film with as much history, legend, and lore behind it as 'The African Queen' requires a comprehensive documentary to cover all the fascinating territory, and that's just what we get here. This engrossing, elegantly appointed examination of one of the most challenging productions in film history provides an insider's look at the personalities, obstacles, machinations, camaraderie, and crises that shaped, fueled, and almost sabotaged this classic film. Newsreel and rare on-set color footage, stills, and archival interviews with Hepburn, Huston, and cinematographer Jack Cardiff add priceless perspective to the documentary, which chronicles almost every aspect of production. From the sublime to the ridiculous, 'The African Queen' had it all. 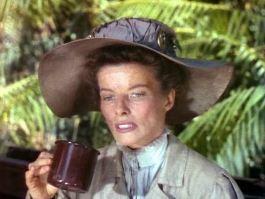 We learn about location scouting, Huston's penchant for elephant hunting, Bogart's heavy drinking and peerless professionalism, Huston's directorial philosophy (and the critical advice he gave Hepburn), the illnesses that plagued cast and crew, and how the House Un-American Activities Committee indirectly influenced the decision of the two stars to participate in the project. Martin Scorsese, film critic Richard Schickel, historian Rudy Behlmer, and other notables also provide input and analysis in this top-flight documentary that every 'African Queen' viewer should see. It took a while, but 'The African Queen' has finally sailed onto DVD and Blu-ray, and an impeccable 1080p transfer, solid mono audio, and one terrific supplement make this disc an instant must-own for serious movie fans. John Huston's expert direction, the incomparable portrayals of Humphrey Bogart and Katharine Hepburn, and the exotic Congo locales transform a simple story into a timeless tale of love, courage, and conviction that people of all ages will enjoy. No movie collection worth its salt should be without this beloved classic.